Being seasick has got to be one of the most miserable, unpleasant feelings imaginable; and unfortunately, it’s a condition that most divers will experience at least once. For some, seasickness is such a regular occurrence that it seriously impacts upon their enjoyment of diving- after all, there’s nothing like acute nausea to ruin a day out on the ocean. Of course, those that suffer from seasickness could confine themselves to diving from shore; but the fact remains that many of the world’s best dive sites are only accessible by boat. This article aims to help divers overcome their seasickness, so that they can get the very most out of their time on (and under) the water. 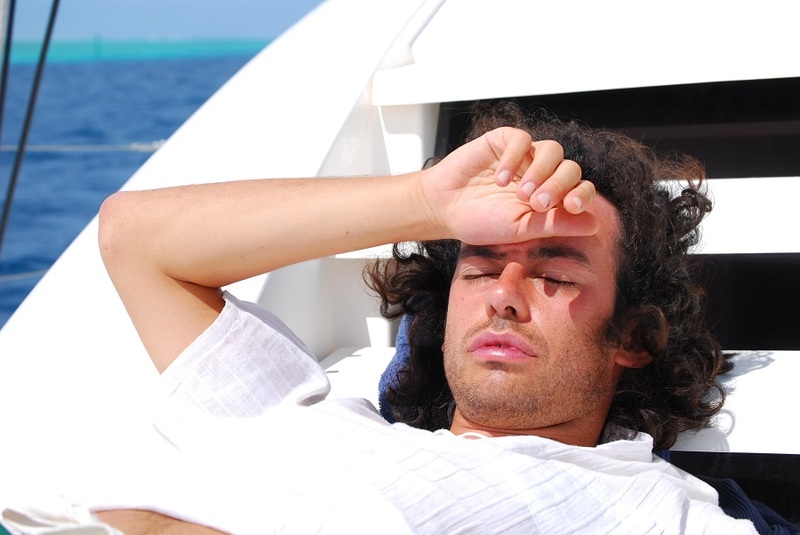 The first step to triumphing over seasickness is understanding what causes it. Seasickness is essentially the same as any other type of motion sickness- which is why those that are prone to the condition are also likely to experience its symptoms when flying or driving. The root of the problem is that when we are on a boat, the objects around us (e.g. the deck, the steering console, the dive cylinders, our buddies) seem static, but in reality, the entire vessel is moving with the ocean swells. This results in our brain receiving conflicting signals- from our eyes, that see the unmoving objects in our immediate vicinity and tell the brain that we are on solid ground; and from our ears, whose equilibrium sensors signal that in fact the opposite is true. The confusion that results from these mixed messages is what triggers the nausea that makes seasickness so unpleasant. For most people, the instinctive reaction to a sickness of any kind is medication, and certainly there are several pharmaceutical solutions available for seasickness sufferers. From over-the-counter tablets like Stugeron, to prescription transdermal patches like scopolamine, there are plenty of options when it comes to seasickness drugs. However, divers must be very careful when taking medication, as many of these drugs involve serious side effects including impaired judgement and drowsiness. Clearly, divers need to be in complete control of their faculties underwater, so that they can respond quickly and effectively in the event of an emergency. There are some drugs that do not have these negative side effects- however, divers should always seek the advice of a medical professional before taking seasickness medication. If you do choose to take pills to counteract nausea, make sure to take them before leaving shore- most drugs need time to enter the bloodstream if they are to work effectively. There are also some alternative, non-chemical seasickness remedies, including bracelets that stimulate acupuncture points on the wrist to prevent symptoms from occurring. Seasickness symptoms can be reduced or exacerbated depending on what you put into your body both before and during your dive trip. Obviously, drinking alcohol before diving is not a good idea- firstly, because the nausea associated with being hungover can easily translate into seasickness; and secondly, because alcohol causes dehydration which in turn increases susceptibility to the same condition. Staying hydrated in general is an important part of preventing seasickness, and divers should make sure to drink plenty of water for the duration of their time at sea. Your pre-dive meal also has an impact on your resilience to becoming seasick. While it’s a good idea to eat something an hour or two before boarding the dive boat in order to maintain energy levels whilst underwater, those that are prone to nausea should steer well clear of greasy, spicy and acidic foods, and favour plain carbohydrates instead. According to anecdotal evidence, there are also some foods that can help even after nausea sets in. These include saltine crackers, and anything derived from ginger, both of which appear to help settle the stomach. As for liquids, Coke is meant to help seasickness sufferers, as it contains the same phosphoric acid and sugars that are found in Emetrol, an over-the-counter anti-nausea medicine. Equally as important as your diet is where you place yourself on the dive boat. Whether you’re picking a berth on a liveaboard, or simply a place to stow your kit for a few hours, try to choose a location in the centre of the boat. Here, the pitching and rolling motion that triggers those confused signals that cause seasickness is less pronounced than at the bow of the boat; and, you will be removed from the stench of the engines at the stern. Because odour (whether its that of diesel, cigarette smoke or another person’s vomit) can exacerbate feelings of seasickness, those that are already affected should seek fresh air out on deck. An added bonus of being topside is that you are able to focus on the horizon- in doing so, the messages from your eyes and ears will become less disjointed, as the horizon provides a reference to land, rather than to the deceptively static objects on the boat. If you are already feeling sick, it’s a good idea therefore to keep watching the horizon, rather than attempting to perform tasks that require focusing on closer objects- like reading, or making alterations to dive gear. Unfortunately, seasickness is not a particularly reliable beast and on some days you may feel nauseous despite all of your best attempts at self-help. In this situation, sometimes the only cure is actually to be sick- although you will want to make sure you throw up over the leeward side of the boat so that your vomit doesn’t make an unwelcome reappearance. Don’t be shy- any diver worth their salt will have seen it all before (most probably from a personal perspective). For many divers, seasickness disappears as soon as they enter the water and escape the confusing motion of the surface swells. However, if you find that you need to be sick underwater, make sure to keep your regulator in your mouth. It may seem unsavoury, but your regulator is designed for that precise eventuality. Your natural reaction after throwing up is to inhale deeply- if your regulator is not in place, you will find yourself breathing in seawater instead of compressed air. If you succumb to seasickness either on the surface or underwater, remember to rehydrate with water or electrolyte drinks that can replace lost body sugars. Because overcoming seasickness is not an exact science, it’s important to know what to do if the condition does get the best of you. However, if you follow the steps listed in this article, you will find your susceptibility greatly reduced- and your enjoyment of the underwater world given new life as a result.